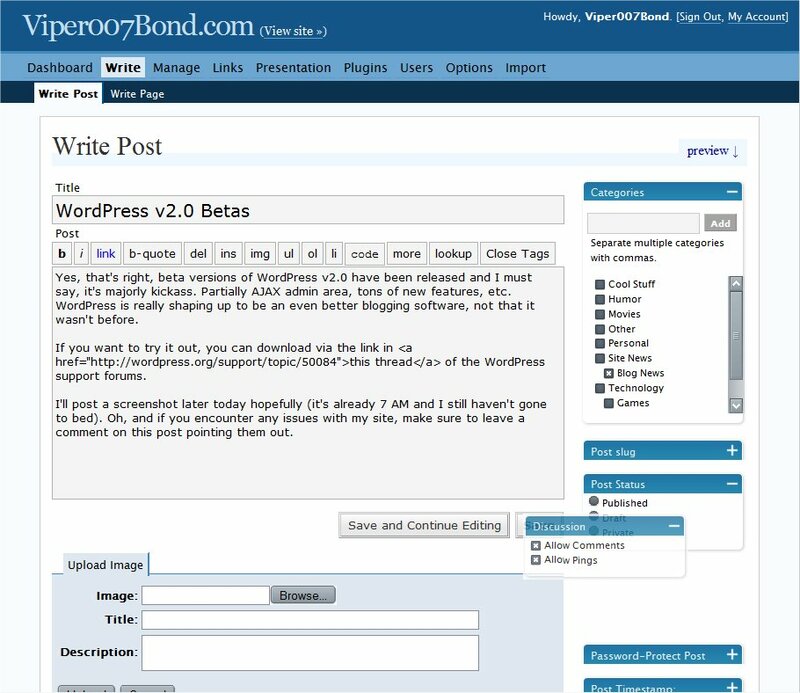 Yes, that’s right, beta versions of WordPress v2.0 have been released and I must say, it’s majorly kickass. Partially AJAX admin area, tons of new features, etc. WordPress is really shaping up to be an even better blogging software, not that it wasn’t before. If you want to try it out, you can download via the link in this thread of the WordPress support forums. I’ll post a screenshot later today hopefully (it’s already 7 AM and I still haven’t gone to bed). Oh, and if you encounter any issues with my site, make sure to leave a comment on this post pointing them out. Update [6:23 PM]: Here’s the screenshot of WordPress v2.0. Note the draggable boxes on the right side and the AJAX category selection. Update [7:10 PM]: Just realized I screwed up my .htaccess when I was working on it last night. Permalinks / comments should work now for posts. Sorry. This entry was posted in Blog News, WordPress. Bookmark the permalink.